An e-mail has been sent to Kimberly and she has 48 hours to respond before a new winner is chosen via random.org. One thing I've learned in life is it's never too early nor too late to care for your skin. I really wished someone would have taught me to take better care of myself when I was younger, getting those tans and not properly cleaning my skin. I also had no idea how toxic some of the every day products we use are to our bodies and skin until I started to research more about organic products. As with natural products like supplements and vitamins, it can be a confusing area to understand since some abuse the terms "natural" and "organic." There are different levels a business can use to make those claims and just because a product has "natural" or "organic" on the label/package, it's not necessarily true they are 100% pure and natural. I sort of see it with the bread industry with wheat and whole wheat ingredients. I used to buy wheat bread thinking it was better for me but I eventually learned most bread is made of wheat anyway and has been stripped of its nutrients. Whole wheat is what to look for in bread products. Back to organics and my introduction to a complimentary product by L'uvalla. I had never heard of L'uvalla until I saw it on another blogger's site and I became very interested as I pursuit ways to improve my skin and retain it's youthfulness. The L'uvalla Certified Organic Hydrating Milk Cleanser is 100% natural. It's created with a blend of organic plant ingredients that gently cleanses and removes make up while hydrating the skin. I liked how it felt as I massaged it into my skin. The ingredients call for a quarter size amount but I used a little less and still had plenty to wash my face. That's a bonus to me as it means it will last a long time. It didn't suds up like some cleanser and it was thick enough to stay put while I massaged it in. It rinsed off effortlessly and didn't leave a sticky feel or film. I've been using the L'uvalla Hydrating Milk Cleanser for over a week and a half and really like how it feels. My skin is softer and I've stopped using my Proactive as much and not noticed more break outs which is another plus. I also like the pairing up of natural products to produce a product that not only cleans but also has other properties such as aromatherapy. It's a great all in one product for cleansing, moisturizing, anti-inflammatory and anti-oxidant while soothing and calming the skin. I think my next product that I'll purchase will be the Balancing Eucalyptus Toner to help minimize break outs and give my Proactive a rest. I like the idea of natural products to treat and protect my skin. Hydrating Milk Cleanser is a vegan cleanser formulated with anti-inflammatory and antioxidant agents that moisturizes, cleanses, calms and soothes the skin. Each ingredient provides a different action for the skin and altogether, it's a great product priced at $34.99 that lasts three months. Overall, I would recommend the product as it's not harsh, is effective and left my skin feeling soft and moisturized. My skin type is normal/dry with breakouts and it has responded well to date. The founding principles of Yuvalla is to balance east and west with holistic mindfulness with pathways, products and services. 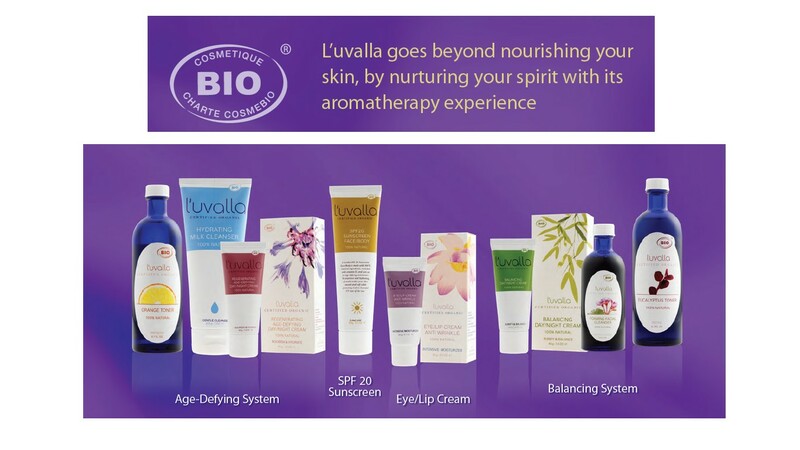 Yuvalla introduced their first product line: L'uvalla skincare products that are 100% natural and organic. Click here to read all about L'uvalla. They have a line of skincare products ranging from age-defying to sunscreen to eye/lip cream to a balancing system. L'uvalla products far exceed the USDA's requirements for organic certification as they also bear the European COSMEBIO certification. One lucky reader will receive their very own three month bottle of L'uvalla Age Defying Hydrating Milk Cleanser! Follow my blog and tell me what other product from L'uvalla you would like to try. *Disclaimer: I received a complimentary product for the purposes of this review. I learned that when I hover my mouse over each ingredient, it gives me a full description of the ingredient. Amazing! Subscribed and would love to try the Orange Toner and the Hydrating Milk Cleanser. I love a great organic product! I'd like to try the Balancing Cream. I would love to try the balancing cream for my problematic skin. I entered your Total Pillow giveaway! (1/5) I forgot to mention in my earlier comment that I follow you on GFC as Jennifer Mo. I entered your Total Pillow giveaway (2/5). I would like to try the ORANGE TONER. Being aware of UV induced skin cancer, I would like to try L'uvalla's SPF 20 Sunscreen. The Orange Toner sounds good to me too. A citrus aroma always makes me feel clean and fresh. I would love to try the eye/lip cream. I'd like to try the Balancing Cream. I think it might help to balance skin tones. I'm a follower by GFC. I follow your blog and I would like to try the balancing cream for my combination skin. I would love to try the Balancing Toner! And I am a follower on GFC! I follow you on Twitter @Xocaisgood! #2 I follow you on Twitter @Xocaisgood! I would love to try the balancing cream, thanks! I would love to try the L'uvalla Balancing Day/Night Cream. Entry #1 --> I learned that L'uvalla carries the stringent European Eco-cert organic certification and is natural vegan, cruelty-free, and formulated with active ingredients that are certified 100% organic. Entry #2 --> I learned that L'uvalla carries the stringent European Eco-cert organic certification and is natural vegan, cruelty-free, and formulated with active ingredients that are certified 100% organic. Entry #1 --> I am following you on Twitter (Nelsby). Entry #2 --> I am following you on Twitter (Nelsby). Entry #1 --> I *Like* you on Facebook (Aimee Waerhouse). Entry #2 --> I *Like* you on Facebook (Aimee Waerhouse). I would like to try L'uvalla's SPF 20 Sunscreen and I follow. Follow you on Blogger/GFC, would love to try the balancing cream.